Notice: this discount code has expired!! That is a fantastic deal! I have let my readers know about it and your new cookbook too. Thanks for passing it along. Thanks, Kent. I'm looking forward to meeting you on the cruise in May! Thanks – made a note of it! I didn't realize you are going on the next cruise. Waah – we're next time most likely! I would love to meet you. Somehow my comment never made it in! I cannot get the ezsweets 50% discount to apply. The message I get is that the discount code is "invalid." I just tried it and it worked for me. They told me the same code will work on the EZ-Sweetz website, so you might try that. Let me know if it still doesn't work and I'll see if I can figure out what is wrong. Hi Jennifer! I've been hoping you would join us a cruise. It is a long way to go for me and I have to take sea-sickness meds, but it's still worth it. Well, the code still didn't work (had hubby try from his computer as well)….and the ezsweets site seems to be having some serious problems, but I am not going to worry about it. So, you're going to be on the LC Cruise, Judy? I'm looking forward to it…last year's was truly amazing. You'll be in great company with Fred Hahn….he was terribly seasick from the minute we left the dock….maybe even sooner than that! This is very strange as it gave me the discount when I typed the code in the bar. I haven't had anyone else say they had a problem. Perhaps you can try again tomorrow. Let me know if it still doesn't work and I can check with the compamy. I saw a lot of people on the cruise wearing a patch behind their ear. Maybe I should try that! I'm looking forward to it this year. It looks like we are going to have a much bigger crowd. Just ordered with the discount with absolutely no problem! Thank you so much! Thanks for letting me know, Kathy! Ok, so I figured it out! 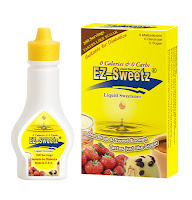 The link takes me to a page that has several version of the EZ Sweets bottles. I chose the one I wanted, which was NOT the $12.99 bottle, and got an "invalid code." When I went back and checked the single bottle for $12.99, I got the discount! Thanks for setting that up for us, and sorry I didn't understand. Those patches behind the ear are (I think) helpful. Sometimes they make a person a bit sleepy, and I think you need to start using them a day or two before you board the ship, but check with your doctor, because I never get seasick, and I am only relaying what some people have told me! Thanks for figuring that out Georgene. I didn't realize the code only worked for a certain size. I just ordered the 6-pack of little bottles; coupon code was accepted without difficulty. Thanks so much for the discount, Judy — that's just wonderful!